As I write this I am sipping on very sweet strong coffee, and eating a freshly prepared fruit salad, sitting on the balcony of my $15 room. Instead of rushing off sightseeing, I am taking it easy, trying to work with the Ubud rhythm and also taking a moment to catch this blog up! So I arrived in Ubud yesterday afternoon. 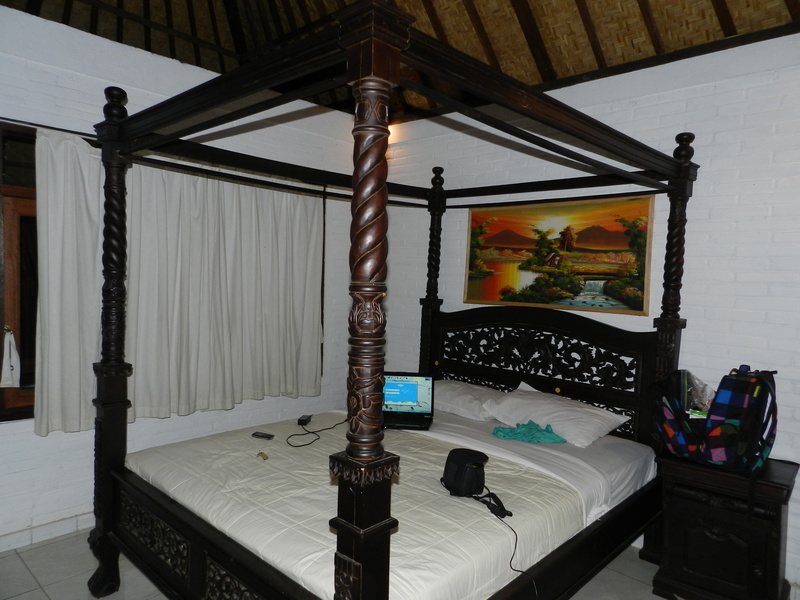 I had a driver take me from my hotel in Legian all the way to Ubud. Davy was a well informed man with little to say, but questions he could easily answer. Interestingly the journey was shared with another guest from the same hotel who was from Melbourne – so thanks to my Australian experience we found we had plenty to talk about between commenting regularly on the alarming number of motorists with no helmets on, cyclists with no helmets on and that despite the somewhat erratic nature of the roads I noted that about 90 % of vehicles on the road looked brand new, and I didn’t see any with signs of previous accidents. Much as I love driving, you’ll know from previous posts, I have to say Indonesia is not somewhere I would willingly rise to the challenge. On our way to Ubud, as predicted we stopped at a number of places. Yes of course these were all very interesting, and even a few things to be learnt by watching people creating works of art or traditional crafts, but I couldn’t help feel that I was a bit of disappointment to my driver and owners of the places we visited, as I didn’t once put my hand in my pocket to make a purchase. I didn’t take any photos ( and quite probably wouldn’t have been allowed ) of the ladies working on silk batiks, or the jewellery makers working on filigree earrings and the artists in different stages of their 3 week paintings. I really do appreciate seeing things like this, but can’t help but feel a sense of desperation as we are steered into these places and looked upon hopefully as tourists with money who might make their day. 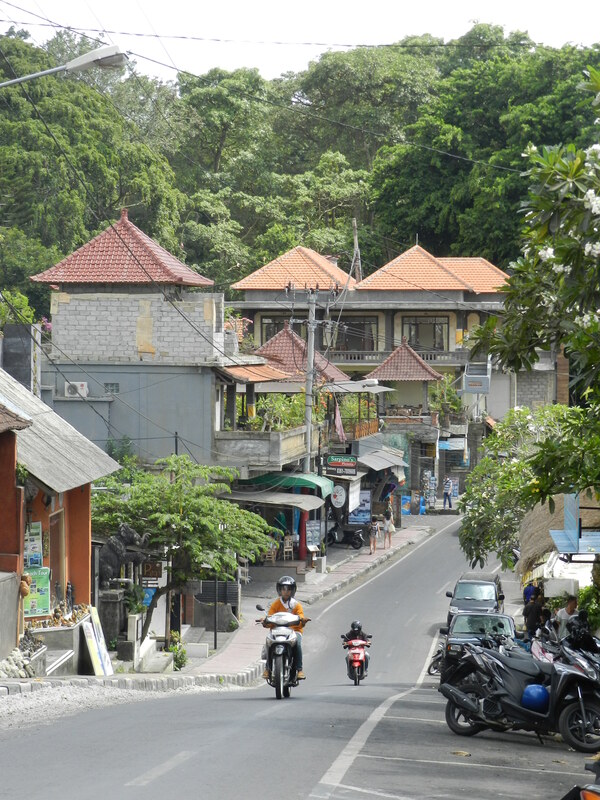 Once arriving in Ubud a communication problem, a traffic jam and a very hot day meant that finding a place to stay was a little more stressful than needed. We drove past the first two places I wanted to try and by the time I realised we were looking for somewhere to drop me off, all I could do was jump out of the car in traffic and run to a few of the many guesthouses that Ubud is abundant with. I was going to go for a little luxury – hoping for a pool in a lush green garden, but what I ended up with – where I am sitting now couldn’t be better. Right down the end of a gang ( small lane way ) I found Rice Paddy Bungalows. Having tried a place recommended by the Lonely Planet which was revolting, and another place in the same gang as this which looked mosquito ridden I was happy to land upon this. There’s only 6 rooms here – in three buildings and set in a lovely green garden. Cadek, who later told me his name was lying on the ground when I poked my head into the garden. “Yes?” He said smiling, as he jumped up and put his t-shirt on. He showed me the available room – up a steep set of stairs, but wonderfully spacious, spotless and incredibly good value. It’s a large room with a beautiful 4-poster bed ( I have always wanted to sleep in a 4 poster bed!!) 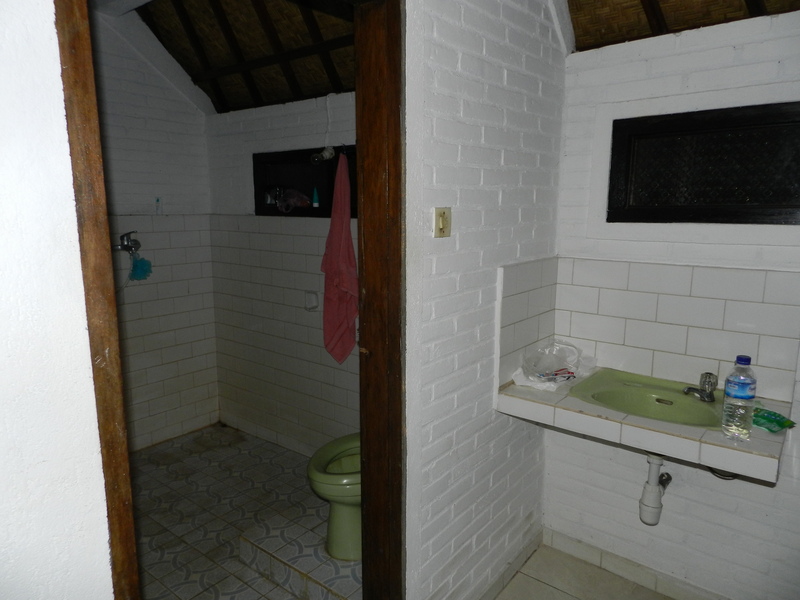 and a bathroom which is kind of a wet room. I have a large balcony with table and chairs, breakfast included and wifi in my room. Not to mention the very friendly staff who asked me politely where I was from etc but thankfully did not ask me where my boyfriend was or enquire as to why I was travelling alone – two questions I am already tired of answering – so much so I have taken to wearing a fake engagement ring!! Kedak also came all the way with me back to the car to collect my suitcase. When I asked if he’d mind helping me I hadn’t realised he’d be willing to take it all the way there and then – to my shock – pick it up and carry it on his head up the steps to my room! Everytime I have met Cedak he as greated me warmly, remembering my name. This morning, I woke up nice and late for once and once he saw me on my balcony he rushed up to offer me the breakfast menu. 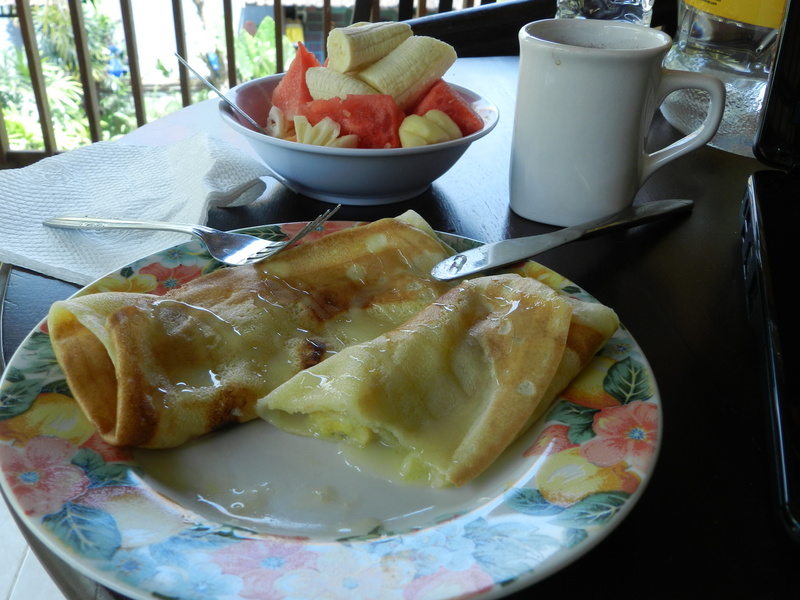 What arrived was delicious indeed – A banana pancake drizzled with honey, a black coffee and fruit salad of banana, papaya, pineapple and melon. Incredible value for just $15 – compared to the revolting room I stayed in the previous night which I paid $4o for! 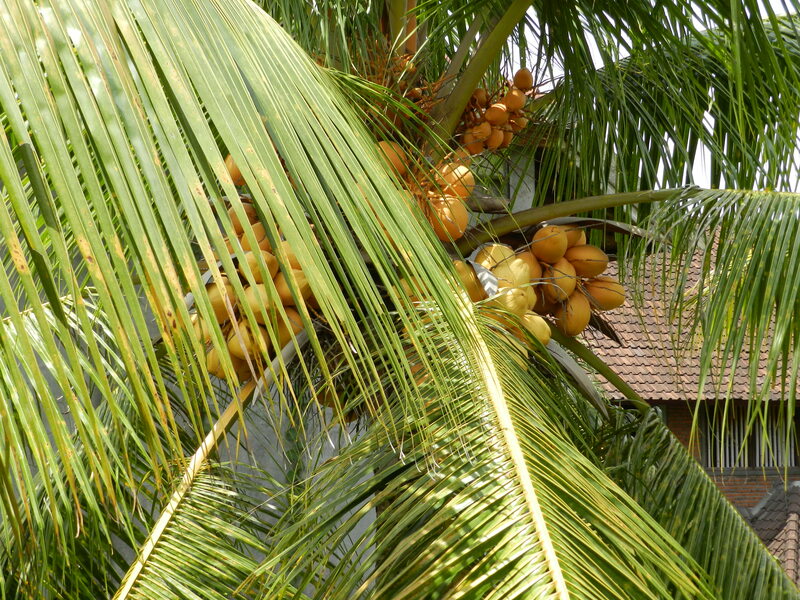 Posted on October 15, 2013, in Australian Adventure and tagged Bali, banana pancakes, batik, driving, food, guest house, hostel, Monkey Forest Road, paintings, photography, Rice Paddy Bungalows, silver jewellery, smile, travel, travelling, Ubud, working holiday. Bookmark the permalink. Leave a comment.